Valve boss Gabe Newell has posted a photo of himself on Reddit to prove his identity after the threads he created received little response. 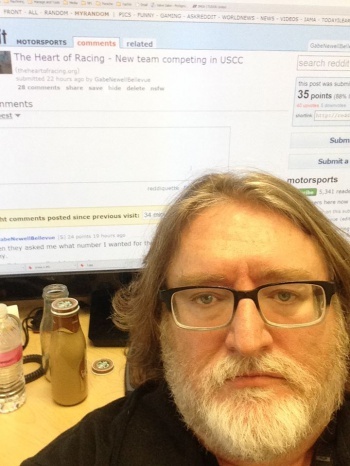 In news I'd never thought I'd ever write, Valve boss Gabe Newell took a "selfie" and posted it on Reddit to prove it was really him behind the keyboard. This was prompted by Newell after his initial Reddit threads elicited lukewarm responses from users. Initially, Newell created a thread in r/Gaming to promote The Heart of Racing charity event, which only got 30 comments; this was then followed by another thread titled, "Gabe Newell has a question," that also didn't go over that well. In his third Reddit thread in r/Motorsports, Newell posted a picture of himself in front of a monitor showing the same Reddit thread he created in the background to confirm his Reddit username and it did the trick. To date, it has over 2,000 upvotes and over 1.900 comments. Perhaps, the most interesting development here for video game fans is that Newell has promised to do an AMA (Ask me Anything) session on Reddit once the hospital donations tied to the racing event reaches $500,000, which I gather is an inevitability since even now, people are bombarding Newell with questions about Valve, his career and of course, Half-Life 3. Valve and Gabe Newell has publicly been very active recently with the Steam Machines's new controller ditching its touchscreen for buttons, and Newell claiming Valve's goal for Steam Greenlight is to make it "go away."